Spectrum Operations Specialists in the Air Force are like the traffic controllers of radio frequencies. These airmen manage such frequencies to support military operational requirements. This can include everything from land to aircraft to space radio communications, basically, anywhere the Air Force needs to communicate with its members. 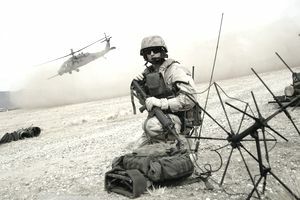 In order for Air Force communications to be uninterrupted and functional, the spectrum specialists troubleshoot interference, which can include countering any attempts at electronic signal jamming by adversaries. It's up to these airmen to make sure there is no interference with electromagnetic broadcasts (including weather-related disruptions) that can affect the delivery and reception of communications over radio frequencies. They'll coordinate frequency needs with federal, military, and civil spectrum management offices and secure operating authority. They review spectrum interference reports and analyze baseline signatures across the cyberspace domain. Identifying countermeasures to neutralize their effects is a big part of this job, and may involve deploying in small teams, whether to provide electronic attack, jamming, deception or other theater-level spectrum management. All enlisted airmen take basic military training (boot camp or BMT) at Lackland Air Force Base in San Antonio, Texas, followed by Airmen's Week. The next stop is technical school, where they receive their job training. Technical school for spectrum operations specialists, which is categorized as Air Force Specialty Code (AFSC) 3D1X4, takes place at Keesler Air Force Base in Biloxi, Mississippi. It's approximately 7.5 weeks or 70 days long and includes the apprentice spectrum operations course. After tech school, these airmen report to their permanent duty assignment, where they are entered into 5-level (technician) upgrade training. This training is a combination of on-the-job task certification and enrollment in a career development course. Once the airman's trainer certifies that they are qualified for their assignment, they are upgraded to the 5-skill level and are considered to be certified to perform their job with minimal supervision. Upon achieving the rank of staff sergeant, airmen are entered into 7-level (craftsman) training, which leads to expanded duty roles such as supervisory and management positions. For AFSC 3D1X4, personnel convert to AFDC 3D190, cyber operations superintendent, when they reach the rank of senior master sergeant, which oversees airmen in various other spectrum and communications AFSCs. You'll need a score of at least 44 on the general Air Force Aptitude Qualification Area of the Armed Services Vocational Aptitude Battery (ASVAB) tests. This is comprised of the arithmetic reasoning, paragraph comprehension and word knowledge subtests of the ASVAB. You'll also need to qualify for a secret security clearance from the Department of Defense. This involves a criminal background check, which will examine your character and finances. Some drug offenses and a history of alcohol abuse may be cause to deny a secret security clearance. In addition, you have to be a U.S. citizen for most military jobs where you'll be handling sensitive information, and this includes spectrum operations specialists.